'samidara1' is an unreleased work for using the method of several granular synthesis programs and random process of the composition. Reference to my other albums of the same concept as 'Graft' (Cold Spring), 'Jigokuhen','Chabo' (important Records), 'Ouroboros' (Soleilmoon). "Merzbow showered me for the first time at CBGB's 315 Bowery, New York, NY 10012 at Bleecker St. I was holding a glass of Wild Turkey in my right hand, the sound cascades whipped, blared, and crossed the space. 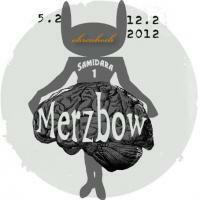 Merzbow contorted like a maned trapped and distraught wild animal trying to break free. A tangle of matt and glistening clusters surging up, embracing each other, then collapsing again. Electric sparks flickered up the walls and cut off 'old zoepfe'. My heart was shining bright orange. My bones and guts vibrated. It was at the time when I played with Voice Crack and Borbetomagus, with my Big Drum and my Electric Rattle. By the way the laying-battery-music was already increasing at that time - namely a trimmed and monetarist pop and jazz drivel. It was an impressive demonstration by Merzbow about what music is able to." Merzbow is a project of Masami Akita who was born, lives and works in Tokyo, Japan. Akita Studied painting and art theory in Art Section of the University in Tokyo. He played in several rock improvisation bands in late 70s, but he gradually withdrew himself from the rock scene and began experimenting in his basement with broken tape recorders and feedback and founded own Noise music. He started a project "Merzbow" in 1981. He practices a vegan life style and is inspired by the political theory of "Animal Rights" from around 2001. Thoughts of Animal Rights are re?ected in his works. He published a book "My vegan diet life" (Ota publication) in 2005, and states Japan had a long history of Anti-Meat eating, and one of best ways to the global warming prevention is the abolitions of the domestic animal system. In the recent work the themes are "Anti-whaling", "Anti fur", 'Anti-Bear hunting'.The latest work is the CD "Dolphin Sonar" (Important) which is a collaboration with the Sea Shepherd. After the Fukushima disaster, Merzbow released the Anti-Nuke concept album 'Dead Zone' on a label in Kiev where near the Dead Zone of Chernobyl.